Woohoo! 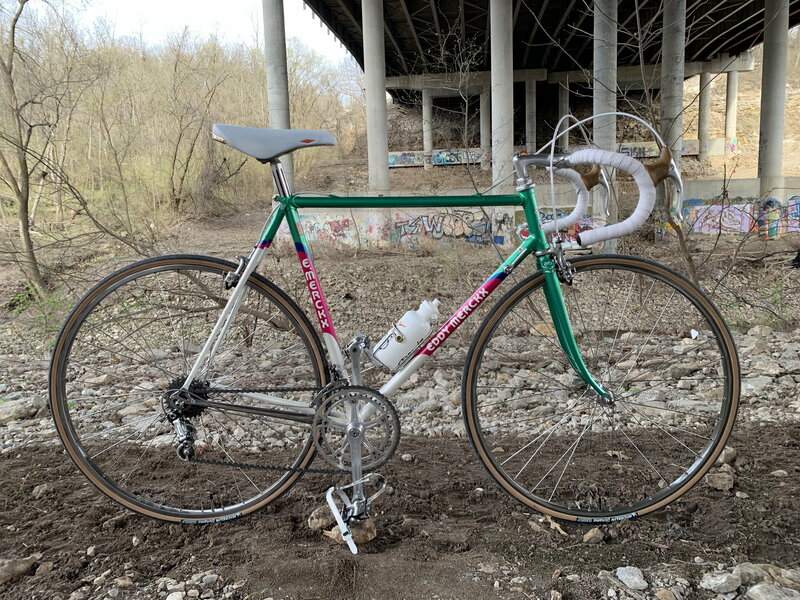 Yesterday was a beautiful, sunny spring day, so I took a ride on my recent acquisition, a 1989 Eddy Merckx Corsa Extra road bike. Team Stuttgart was sponsored by Mercedes Benz and Telekom (now T-Mobile) and the first pro team of Germany according to Wikipedia. Some notable riders: Erik Zabel, Jan Ullrich, Alexander Vinokourov, Andreas Kloden, Cadel Evans and others. The team became Team HTC-Highroad. 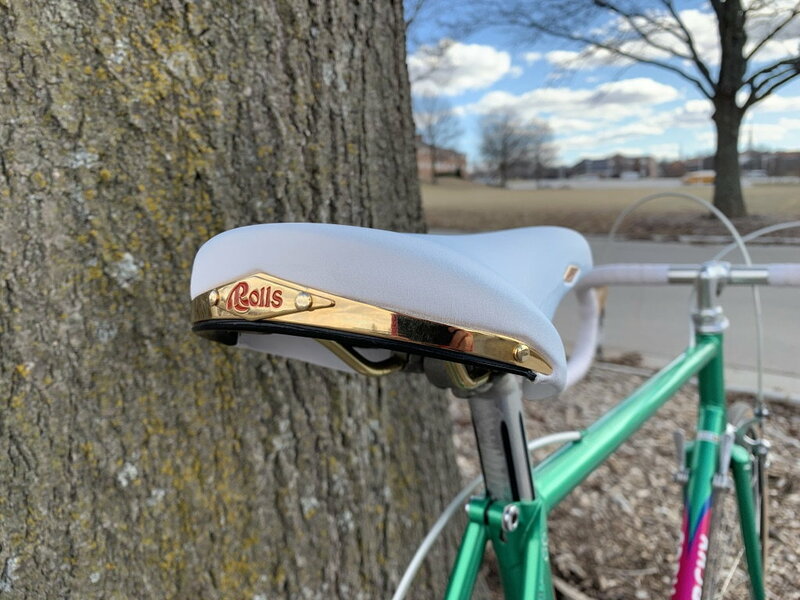 Maiden voyage was a delight, except for a broken chain. Fortunately, I managed to stay upright, and I found a bike shop within walking distance (.7 mile)! 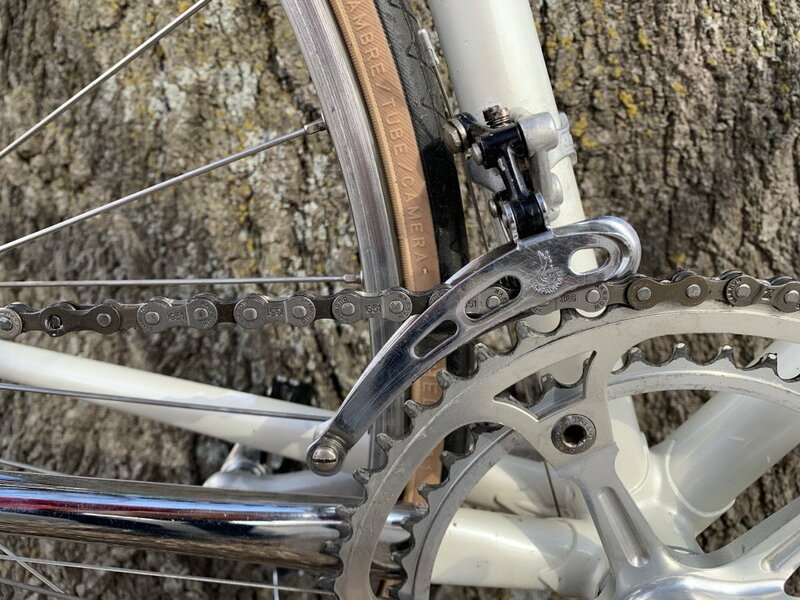 The owner, Darby, set me up with a new smooth-running SRAM chain and straightened, tightened and adjusted my rear derailleur while he was at it. He did this knowing I didn't have a credit card with me. Without taking my contact information, he just said "come on back tomorrow and pay for the chain." He did not even charge for his service. He's found a new customer! The drivetrain was extremely precise and silent on my return ride. Last edited by mcpastor; 03-16-19 at 05:15 PM. I'd scoot the rear wheel back a smidge more. I hear ya. I have some Campy rear axle adjustment bolts on order too. It's a beautiful bicycle. The paint scheme is time machine, taking one back to the late eighties. I really dig it when a bicycle harks back to a past era like that. Might be able to add a link of chain, too, unless the jockey comes too close to the big cogs when the chain is in the small ring. 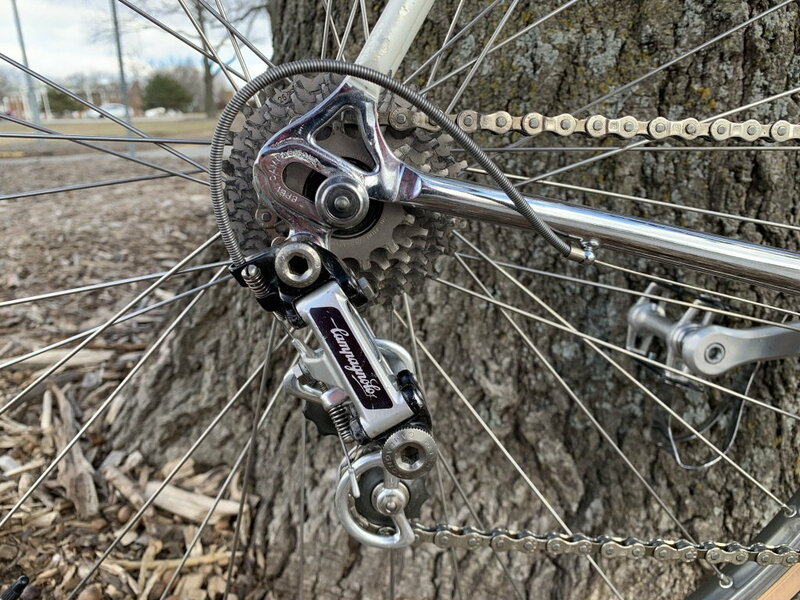 When given enough chain, my super record rd makes easy work of pulling the chain up to a 28t rear cog. Thanks Uncle Uncle. Yeah, the 80’s color scheme was what I liked about it when I saw it. Then I learned the pink was Telekom (T-Mobile). Many good memories of watching them making TDF’s interesting for us. 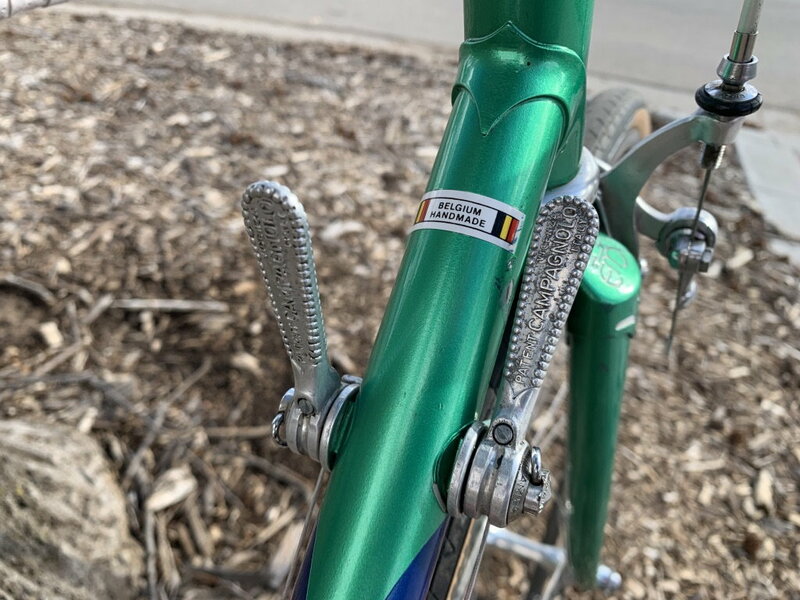 The Super Record on it is a little earlier than the frame, which was usually paired with aero levers and accompanying components—Campy or Shimano—by this time. 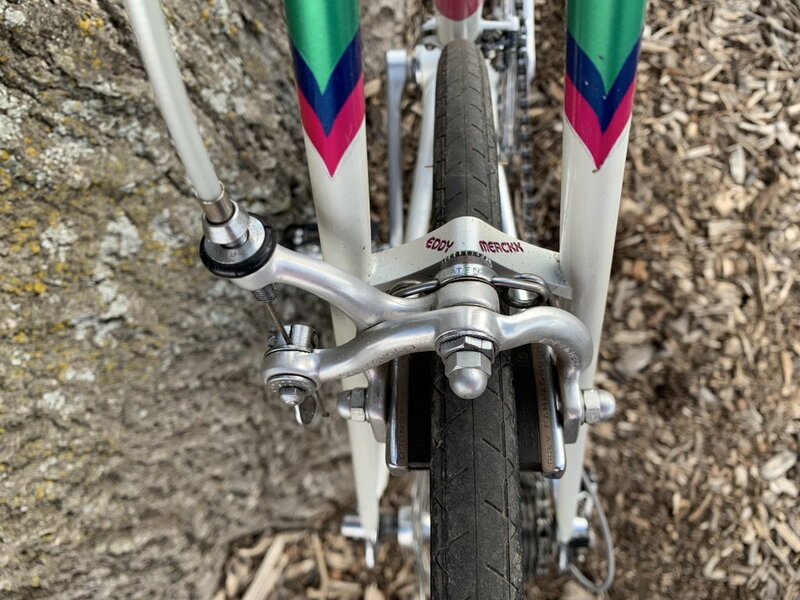 But, I love the look of the old Campy derailleurs, crankset and brake levers (with gracefully exposed cables). 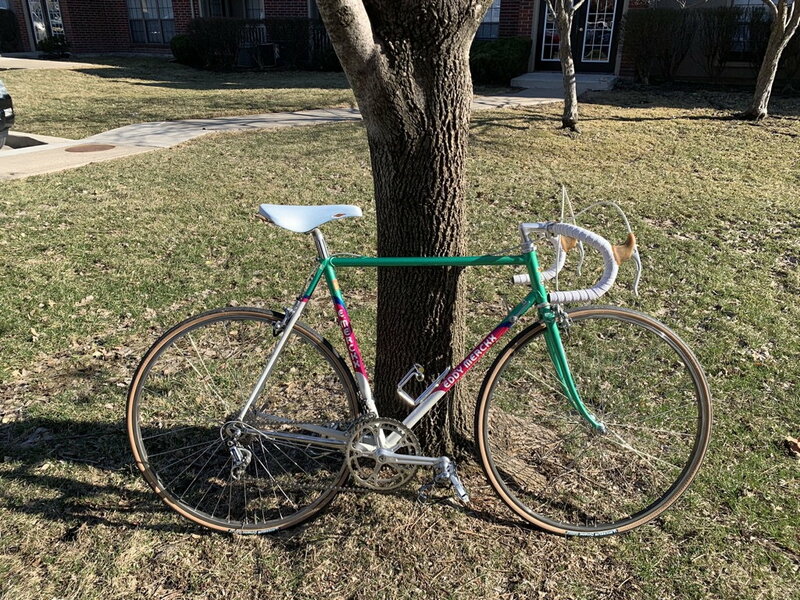 This was the style my Japanese bikes emulated with Suntour, Sugino, etc. when I was a teenage bicycle enthusiast. Last edited by mcpastor; 03-16-19 at 10:21 PM. I usually use the raised face of the droupout as a guide on how far I can have my rear whee forward on the frame. Is this a team bike or a manufacturer’s version of it? It’s a beaut either way. i see many happy miles for you two this summer. Gorgeous bike and well done! If you’re a pro racing fan, it’s kind of fun to trace the genealogy of pro teams. The Stuttgart ——> HTC is a little unusual in that the big teams don’t often completely fold like that. I’d swear HTC morphed to another team but can’t remember and couldn’t find it on a search. A good example of a team lineage is the current AG2R team can be traced back to Team Peugeot. 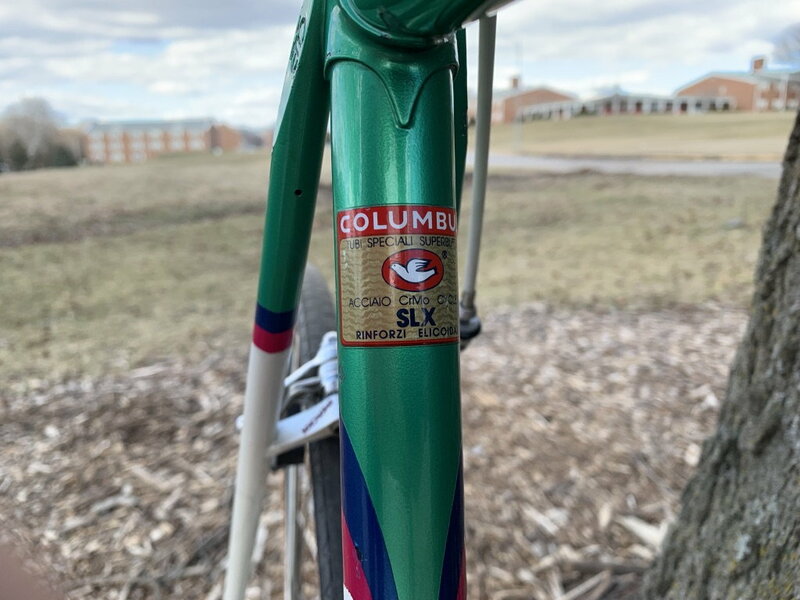 Eddy Merckx made team colors available for purchase, so I don't know whether this was team issue. This particular bike was shipped from Bucharest, Romania, about 1,750km SE of Stuttgart (which is roughly 500km SE of Belgium). 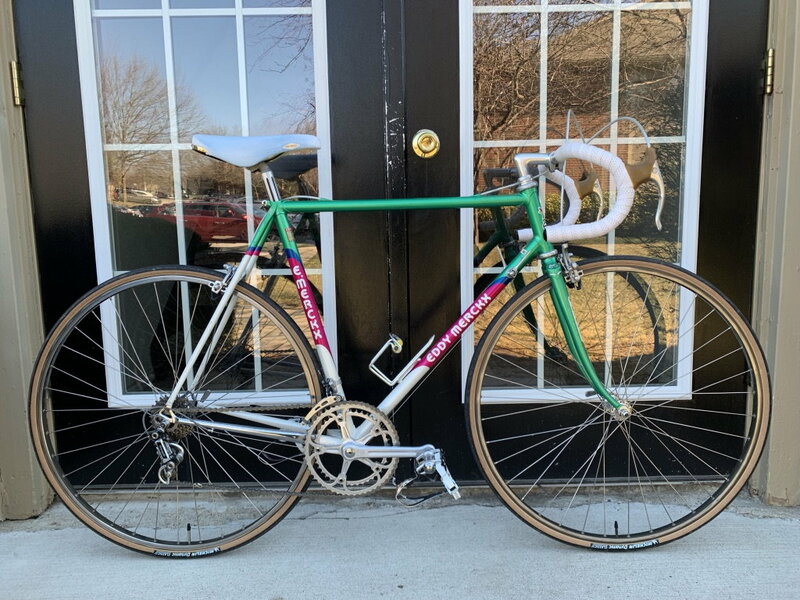 I have an '89 Merckx Corsa Extra Team Stuttgart. Team bikes were outfitted with Suntour Superbe.. The team later became Telekom. 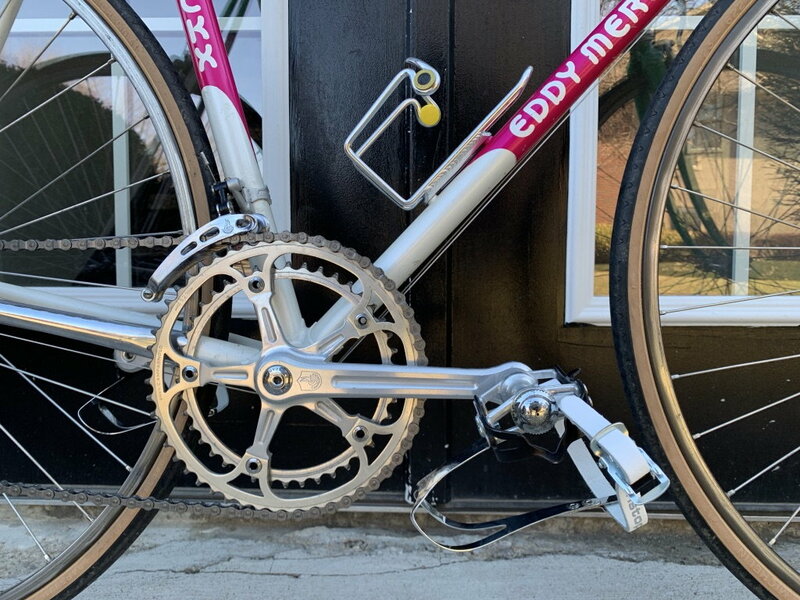 Bikes: Focus trash find commuter, Eddy Merckx Corsa, BP Stealth TT bike, Leader 720 TT bike, Boardman Comp Hybrid drop bar conversion, Quantec CX budget cyclocross build, SerottaNOS frameset ready to build up! What a beauty! Remarkable condition. 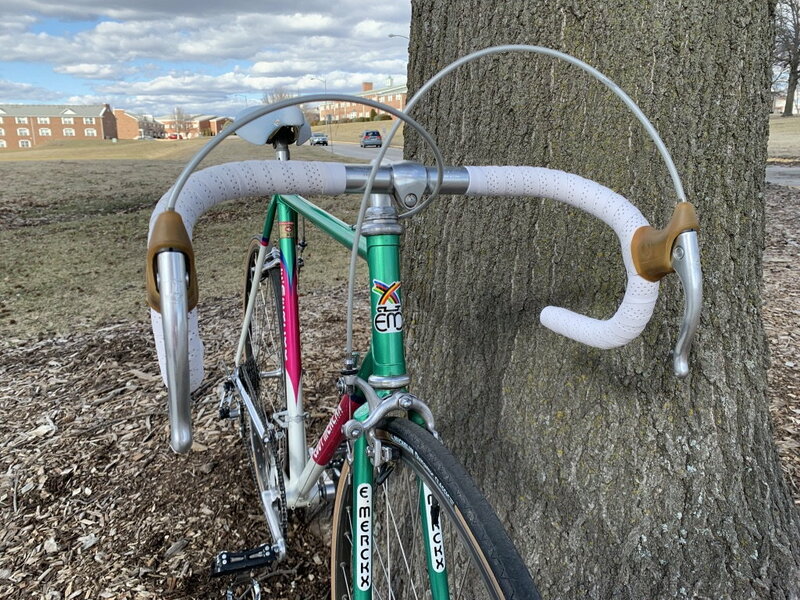 I bought a vintage Cinelli XA stem, 110mm, and rewrapped the handlebars reusing the same tape. Worked out well. It is Cube Race tape. Great stuff and hard to find in the US. They say microfiber but it’s very much like leather. I also rerouted the brake cables to, I think, the “right” way. At least they flow in easier lines. It’s been so long since I’ve had these I had to look at some pictures online.